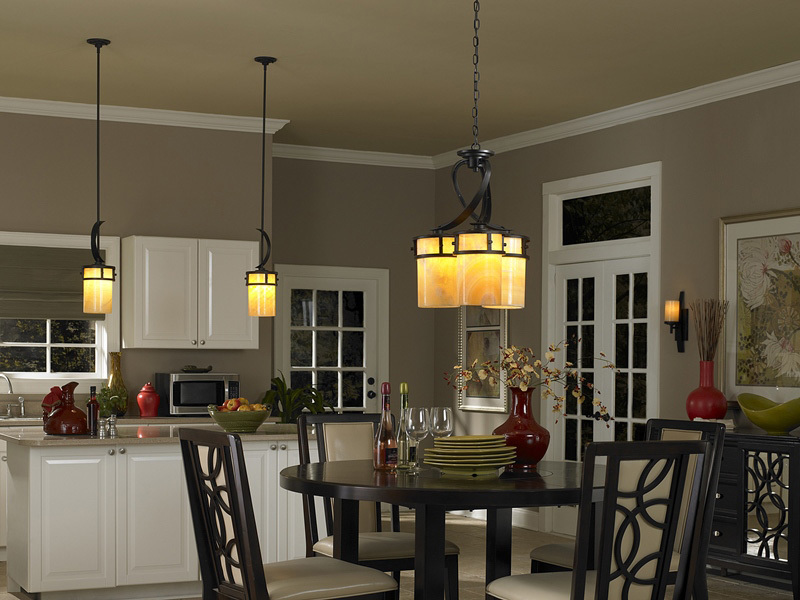 The Quoizel Kyle imperial bronze 1 light mini pendant with onyx shade features a rustic contemporary look, adjustable height rod suspension and downward facing butterscotch onyx shade that give a romantic glow. A compact mini kitchen pendant light, with a circular ceiling mount and rod suspension supporting a wrought frame finished in imperial bronze. The frame contains a beautiful downward facing butterscotch onyx cylinder shade that will give the most wonderful glow. A rustic contemporary look that gives a dramatic flair to your home, this design serves as a piece of art in itself. It features gorgeous butterscotch onyx shades that emit a romantic glow, and wrought iron metal bands that add visual interest. Onyx is a mottled quartz that takes a high polish and was the favourite medium for Greek and Roman sculptors and architects. Onyx has become a cultural symbol of tradition and refined taste. Supplied with two 30cm and two 15cm rods that can be used individually or in any combination to suit you ceiling height, please see the technical information for exact dimensions. A magnificent, contemporary, rustic chic mini pendant light that looks fantastic installed in any kitchen over a worktop, island or breakfast bar either singly or in multiples. The Kyle imperial bronze 1 light mini pendant with onyx shade, designed by Quoizel, founded in 1930 in New York. They relocated to Charleston in 1996 where they remain to this day. They remain a privately held, family-owned and operated business. Quoizel products are now being introduced to the UK market and have quickly built a reputation for their diverse, unique and fresh designs.